The 7.0 GHz milestone was surpassed using an Intel® 3rd generation Core™ i7 3770k processor (aka Ivy Bridge) by renownedoverclocker HiCookie, pushing the GIGABYTE Z77X-UD3H motherboard to a fully validated 7.03 GHz using liquid nitrogen cooling. 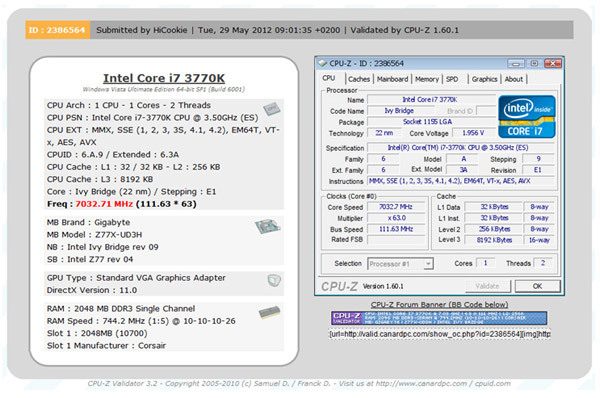 This is regarded as the current #1 highest Ivy Bridge CPU frequency and a world record according to respected globaloverclocking website HWBot.org. 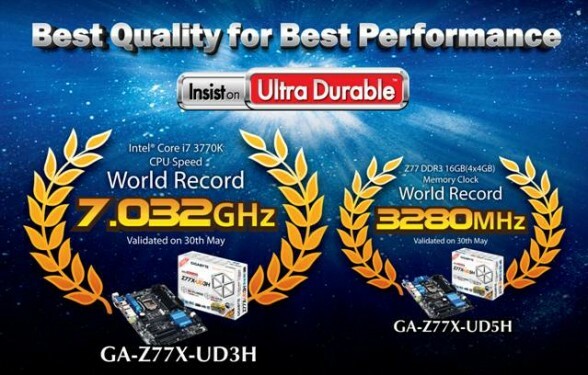 Additionally, HiCookie has broken the current highest memory speed for the Intel® Ivy Bridge platform, reaching an unprecedented 3280MHz with all 4 memory slots populated using the GA-Z77X-UD5H motherboards and G.Skill Trident X DDR3-2800 memory – also a new world record. This new record was achieved thanks in part to GIGABYTE’s engineering prowess and tried-and-true memory tuning capabilities. The next will be another world record overclock :)).